What does God do when a nation tries to silence His Church? Please read this informative article by Rev. Mario Murrillo. "If I listed everything the church could say ten years ago that she can't say today you would be horrified. Without a miracle, your children and grandchildren will have to survive in a world that will totally ban their faith - even scarier, they'll do it without you." Posted with permission of Mario Murrillo Ministries. If I listed everything the church could say ten years ago that she can't say today you would be horrified. Without a miracle, your children and grandchildren will have to survive in a world that will totally ban their faith - even scarier, they'll do it without you. It is hard to convince many Christians that they are losing their freedom of speech and religion. They either don't believe it is happening, or they chalk it off to politics. But the erosion of liberty is not only real, it is the greatest threat American Christians have ever faced. The doctrines of our faith that offend are the Cross, the Blood of Jesus, hell, sexual purity, and marriage. They are already being omitted by preachers who feel the heat. They'll tell you it's to reach a bigger audience - trust me, it's the heat. What can we do to stop the church from being driven underground? No vessel of God can seriously entertain the idea that we should stop preaching these truths. That can't be the answer. What then, can we do to reverse this pernicious loss of liberty? 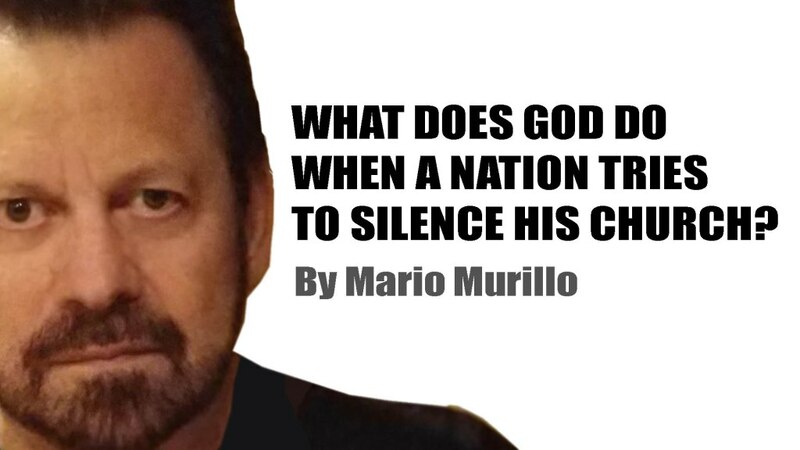 The better question is what does God do when a nation tries to silence His church? The answer came to me suddenly. Hear me out, it is not what you think. It is way beyond petitions, or elections. The revelation I am about to relate to you struck me with paralyzing clarity. I am amazed I never saw it before. However, nothing I am about to say will help you - not one point I make will have its intended impact unless you have a heart for it. If you are still in denial about what is happening, I can't help you - this message can't help you. If you think I am dispensing alarmist extremism, then you are just another part of the threat. But, if you want to hear God's heart on this crisis - if you hunger for more than half-answers, then you have come to the right place. You can ask the Holy Spirit the most important question you could ever ask: What do You do when a nation tries to silence your church? Here it comes. When the leaders of Jerusalem arrested Peter, they didn't know what to charge him with or how to punish him. They knew they had to silence the church. There was no doubt about their intention. They were prepared to do anything to stop the Gospel. So what was stopping them? Answer that, and you get the exact marching orders we need today. Their deep consternation is vividly described in these verses: Acts 4:14 And seeing the man who had been healed standing with them, they could say nothing against it. 15 But when they had commanded them to go aside out of the council, they conferred among themselves, 16 saying, "What shall we do to these men? For, indeed, that a notable miracle has been done through them is evident to all who dwell in Jerusalem, and we cannot deny it?" Their profound dilemma is not lost of Peter. He is seeing the divine solution to government censorship. He has clearly settled on a course of action - the action we need to take today. He leaves, armed with critical information. He gathers the people of God and orders them to pray. He is about to pray a prayer that is the precise model for our crisis - our threat. Remember that word threat. 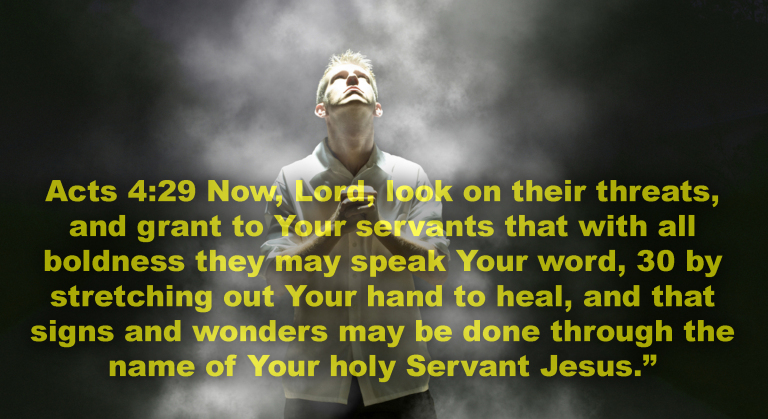 Acts 4:29 Now, Lord, look on their threats and grant to Your servants that with all boldness they may speak Your word, 30 by stretching out Your hand to heal and that signs and wonders may be done through the name of Your Holy Servant Jesus. Acts 4: 31 And when they had prayed, the place where they were assembled together was shaken; and they were all filled with the Holy Spirit, and they spoke the word of God with boldness. Not only were they filled with the Holy Spirit and boldness, but God answered their prayer for miracles. In the next chapter, the very shadow of Peter was healing the masses. Ignore those who aren't willing. Set the time and place to go to homes, houses of worship, schools, offices - anywhere where true prayer can be raised to God. Prove this promise and see the Spirit will fall; you will gain a tongue of fire, miracles will come. I am not talking about self-absorbed emotional light touches. I am talking about undeniable, medically verified, city shaking, divine healings. Shared with permission of Mario Murillo Ministries.